It's a wonder that Jule Styne's beloved Funny Girl is not one of the most revived musicals in London. It has a sparky female lead and sumptuously dreamy score, much like Styne's other masterpiece Gypsy; the real challenge is finding an actress who can take on Barbra Streisand's iconic Fanny Brice. But boy does Natasha J Barnes put her stamp on the role. Funny Girl is the true rags to riches story of Fanny Brice, one of Florenz Ziegfeld's most celebrated actresses. Brice goes from a complete unknown to become “the greatest star”; a story that resonates absurdly perfectly with the discovery of Barnes. After Sheridan Smith received rave reviews, Barnes had the daunting task of filling her shoes for the coming weeks, knowing full well that she will open every night to a sceptical audience. But from the moment she steps on to the stage, she picks up the audience and pops us in her pocket, where we stay dotingly for the entire evening. “I'm the Greatest Star” proves that Barnes has all the wit and talent that you could possibly want for Brice. And although you can't really compare the two actresses, a stark difference between Smith and Barnes is that the latter has a voice that soars right into the rafters, doing Styne's score real justice. Her rousing rendition of “Don't Rain on My Parade” justifiably received the longest applause of the evening. Barnes is duly supported by a delicious Darius Campbell, who may not be the most dazzling presence on stage but who definitely has enough suave to make the entire audience fall head over heels. Joel Montague is heart-warming as Eddie Ryan, showing off excellent tap skills, whilst Marilyn Cutts, Valda Aviks and Gay Soper give a wonderful comic turn as the three Jewish mothers, cooing and fussing over Fanny. Michael Pavelka's extraordinarily simple design is a real treat, with mirrors, lights and two moving platforms doing most of the work. It's actually quite a gorgeous design that allows all of the focus to be on Brice. Lynne Page's choreography is also outstanding, with transitions that make the musical run extremely smoothly. In truth, Michael Mayer's stunning production has everything you could want from a West End musical; grace, wit and a shining leading lady. It's a rare thing these days on the West End to see a relatively unknown understudy make her name in a leading role in a sell-out show. 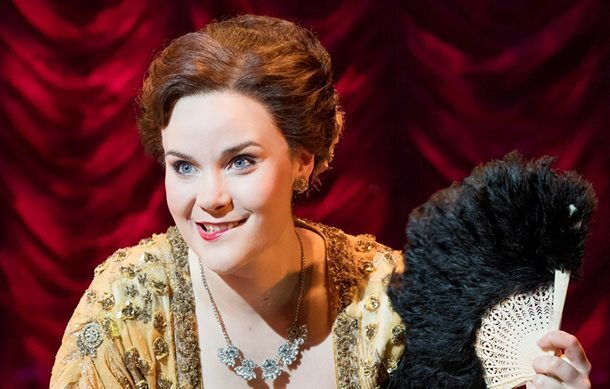 But Barnes' growth through Funny Girl has surely guaranteed her a lifetime in showbiz, and it's highly likely that producers will clamour for her after the show has ended. As she sings "I'm the greatest star, I am by far, but no one knows it" - well, they definitely know it now.